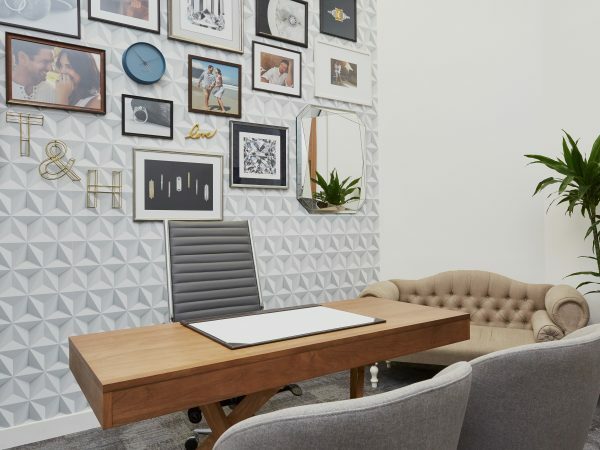 Typically featuring intricate details and geometric lines, Art Deco design has continued into the twenty-first century, impacting on a variety of other design areas from architecture and interior design to textiles and electronics. Stars such as Scarlett Johansson and Olivia Wilde sport engagement rings inspired by Art Deco design. The latest celebrity to be proposed to with an Art Deco engagement ring is Pippa Middleton. The Duchess of Cambridge’s little sister revealed her new diamond engagement ring this week after hedge fund millionaire, James Matthews, popped the question last weekend. From the first look pictures, her diamond appears to be an Asscher cut of around 3 to 4 carats framed in a typically vintage style with a channel-set octagonal halo featuring round brilliant diamonds. Assuming the centre diamond is of the highest quality, we expect Pippa’s engagement ring itself would retail upwards of £200,000. Since the weekend, Pippa has been spotted out running errands showcasing her stunning Art Deco engagement ring, but it’s not just Pippa who appears to be thrilled with the news. A spokesperson for William and Kate said “The Duke and Duchess of Cambridge are absolutely delighted with the news.” While Pippa’s father said “They make a wonderful couple and we wish them every happiness together”. 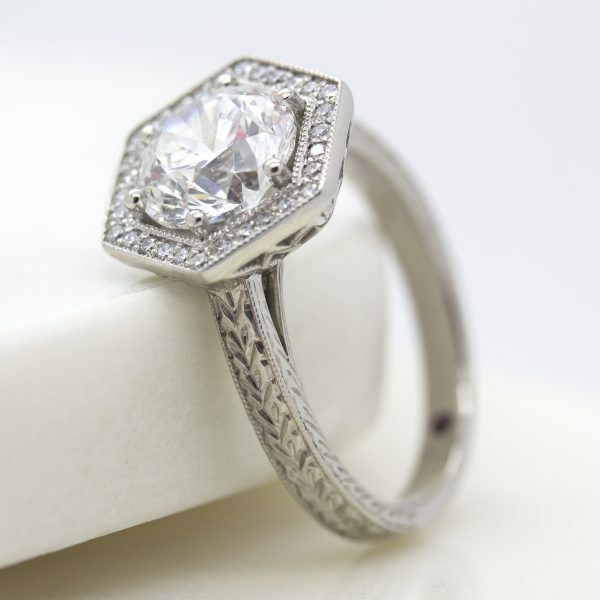 Over the years, we have crafted many Art-Deco inspired engagement rings through our bespoke service, as a nod to vintage design and the tastes of those wearing them. 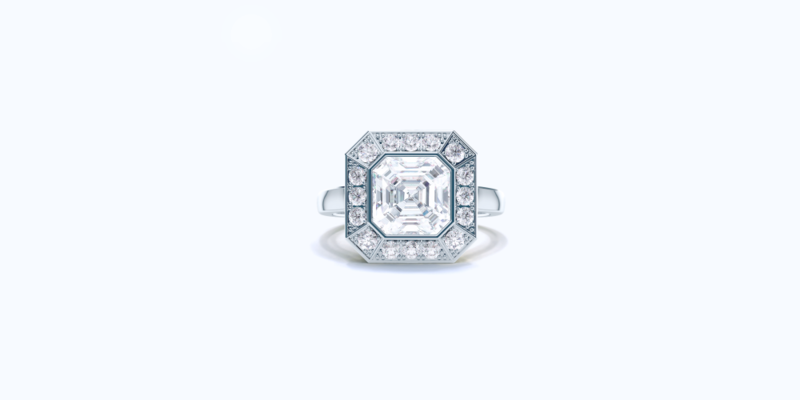 This round brilliant diamond with a hexagonal halo is a perfect example of the intricate and complex nature of typically Art Deco design elements. The centre stone is 2.01 carats and is surrounded by a hexagonal halo of round brilliant cut diamonds which are framed with ornate milgrain detail. Along the band is a wheatsheaf engraving, with further milgrain – the perfect representation of an Art Deco engagement ring design and similar to Middleton’s ring as it features a polygon halo. 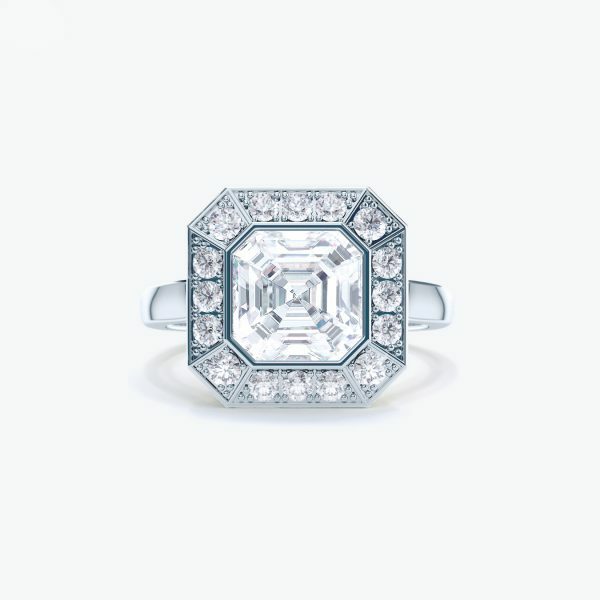 This round diamond also surrounded by a round brilliant-cut diamond halo is a prime example of Art Deco inspired design. With its scalloped edges and pear shaped detail to either side of the halo, this engagement ring subtly incorporates vintage elements to achieve an ornate Art Deco engagement ring. 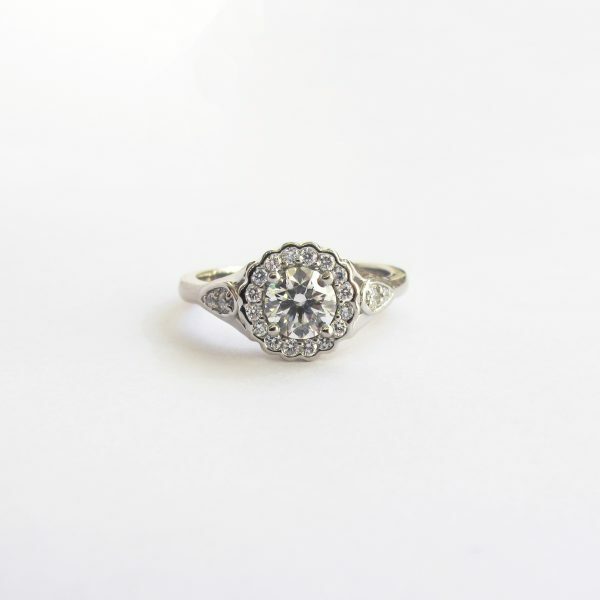 For further information on Art Deco engagement rings, our friends at Ringspo explore the events that influenced the motifs of the Art Deco era, the details that set this style apart and how to choose an Art Deco inspired ring of your own. 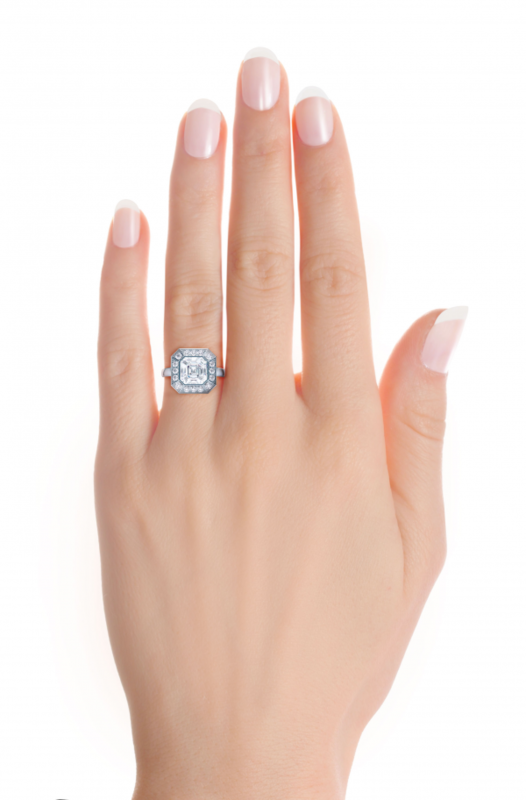 Art Deco is making its firm mark once again on the engagement ring market and with recent exposure in blockbuster releases such as The Great Gatsby, and now worn on the left hands of many famous icons, it’s clear to see why.